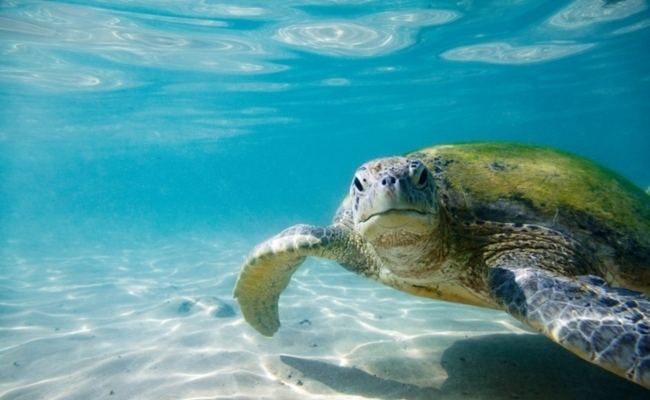 A new study from Australia’s University of Queensland and the Wildlife Conservation Society finds that 1,200 animal species face almost certain extinction. The research, which is published this month in the journal “PLOS Biology“, saw scientists attempt to map the impact of human activity on 5,457 species of birds, mammals and amphibians—a broad spectrum of the natural world that. What the researchers found was that they were able to map so-called “hotspots” where animals face the most pressure. The researchers did this via an ingenious process: they divided the world into a grid where 30 square kilometers made up one square. They then looked at existing geographic data to assign a human activity level to each of those grid squares and then checked how much this impacts the wildlife within those squares. Areas with the highest threat level included places that intersect with modern farming, our cities, places that are heavily lit at night, transport routes and places with high human populations. 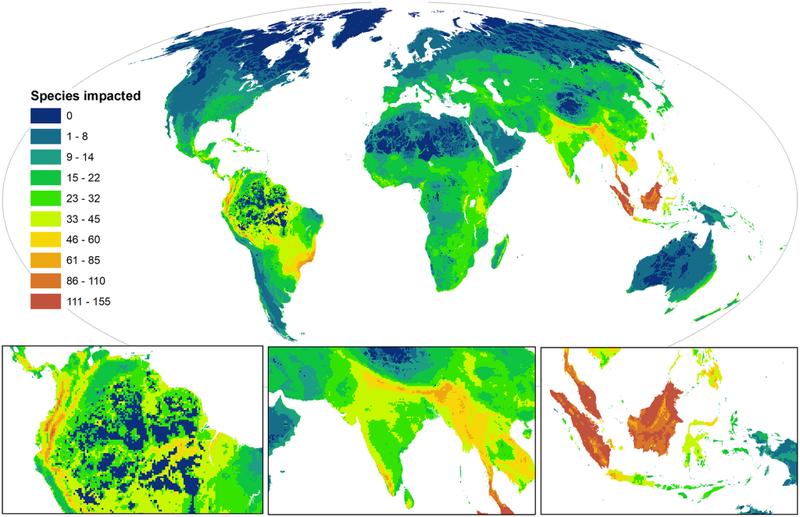 This mapping also allowed scientists to identify “coolspots” where animals are doing better. In many cases, those coolspots are far away from human activity or where human activity is pastoral and, relatively speaking, unobtrusive. That wasn’t always the case, though, because some species are more resilient to pressures than others. Some may tolerate or even thrive when faced with human activity. Using this mapping system the researchers were also able to do something somewhat more unusual: they could look at how animal populations are impacted across their entire range of habitat, not just in individual locations. This provides a top-down look at species pressure that is often hard to quantify. The researchers found that human activity impacts 84 percent of the Earth’s surface, with one or more of the identified pressures impacting 38 percent of all species’ range of habitats. In fact, nearly a quarter of species in the study were affected across more than 90 percent of their habitat distribution. The researchers also warn that, because they can only work with the data they currently have, the impact might be greater. For example, we know that amphibians are suffering due to infectious diseases that are, in part at least, being driven by manmade changing climate. This assessment couldn’t take infectious disease into account, due to a lack of high-quality data, but it is almost certainly impacting amphibian numbers. Land clearing and urban sprawl could drive this infection rate by reducing the available habitat for amphibians, putting the animals into smaller areas, making the spread of infectious diseases easier. The study offers a few somewhat brighter insights. The researchers discovered hotspots and coolspots side-by-side in some cases, for example in the Amazon rainforest and parts of Asia. This is because of the areas’ rich diversity and their ability to sustain many different species with varied needs. This suggests that while human activity is applying multiple pressures to a region, there are species who are resilient and there are areas to which non-resilient species may be able to retreat. It also underscores the need to protect these coolspots at all costs, even as we work hard to reduce the pressures in hotspots where things like land clearing and urbanization meet. The researchers are unequivocal about what is at stake here: if we do nothing, the multiple pressures we are putting on our habitats will, in places of high concentration and low species tolerance, lead to extinctions. We can avert that, and we must avert that. Australia’s natural world is under threat thanks to a government that is failing to fulfill its environmental policies. Sign and share the petition today and demand action to save Australia’s endangered and beleaguered species! We are here to share this planet with all the other living creatures. It deeply saddens me to think of what will be left for wildlife and future generations if people don't stop this path of destruction. I know many people that do care and are working desperately to make changes for the better, but it is going to take a conscious effort on everyone's part to really make a difference. Please put serious thought into everything you eat, everything you wear, everything you buy and toss out. Make better choices in everything you do. It is the only way to save this planet. When you vote, vote responsibly for administrators that care about wildlife and the environment. We, and all living creatures, need and deserve better. So depressing to lose species so fast.